Tomorrow is not just Tuesday — it's also "Tom Waits Tuesday." At least, according to one Denver artist who's obsessed with the guttural singer-songwriter. Colorado Public Radio's Stephanie Wolf (@StephRWolf) explains. These are three words to explain what Denver’s Leon art gallery will offer this Friday, May 11 as they host three “E” performers for a night of music, poetry and collaboration. Esmé Patterson, Emily Ritz and Eleanor Perry-Smith are coming together for just the one night, forming a powerhouse of talent in the small (but active) art gallery for only a few hours. Though the event is free and open to the public, there is a suggested donation of $12 at the door — which is still a great deal for catching three performances in one. Interdisciplinary and in touch with nature and her surroundings, Jess Webb segues between music, performance and installation easily while searching for ways to connect artists with audiences in a community-minded way. Her projects include Cedarbox, a traveling artist incubator in a trailer; Art Church, a monthly hands-on creative playground where artists can loosen up and let ideas flow; performing with Paul DeHaven in the musical duo Saskatoon; and mentoring youth for RedLine's Epic Arts school outreach program. We invited Webb to cast her all-inclusive spell over our readers by answering the 100CC questionnaire. Esther Hernandez introduces herself as a “performance artist, conceptual artist, sort of multi-disciplinary artist.” She leaves matchmaker off the list, even though blind dates are the core ingredient for her latest work. “I'm kind of obsessed with relationships and creating experiences for other people,” she says. The experiences she creates for potential lovebirds are not your average first date. Here, couples play a card game called “Tooth or Dare.” It’s kind of like “Truth or Dare,” but if you refuse to answer the question or do the dare, you have to “take a tooth,” Hernandez says. 4/19/18 - Nonprofit Leon Gallery Give Performance Art a Chance - Westword. From the get-go, Leon Gallery was conceived as a showplace where artists could thrive and show their most experimental work, unsullied by the constrictive forces of the commercial art world, even if Leon was technically a commercial gallery. Now owners Eric Dallimore and Eric Nord have carried that commitment further by going nonprofit, a rarity in any art scene, and a trusting model that essentially turns the space over to an exhibiting artist for a given period of time. You might not always see the most polished work there, but it's certain that you'll see some of the most ambitious, created by artists whose imaginations have been set free from financial restrictions. 3/31/18 - Best New Gallery Move - Westword, Best of 2018. 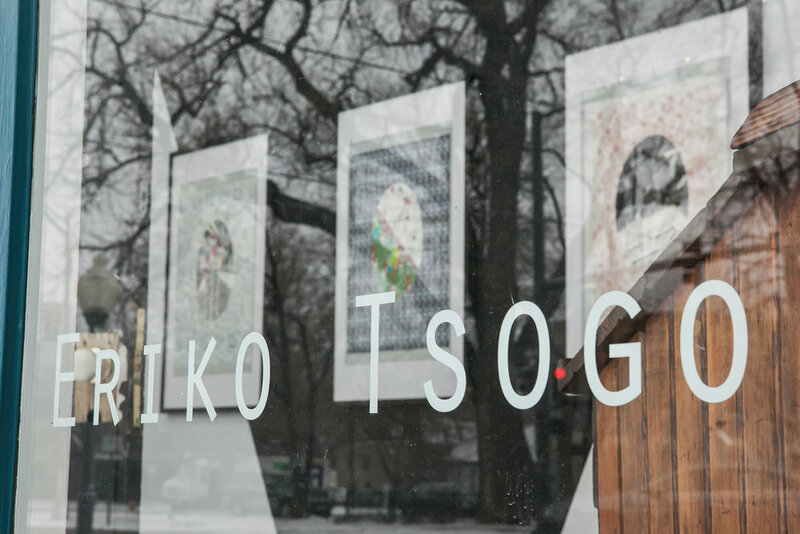 3/2/18 - Artist Eriko Tsogo Grapples With Identity, Displacement And DACA - Nathen Heffel - Colorado Matters, CPR. Eriko Tsogo had the opportunity to speak with Nathan Heffel this morning on Colorado Public Radio about her current exhibition at Leon. We encourage you to listen to Eriko's story, especially considering the recent status of DACA. 2/17/18 - Leon Gallery showcases boundary pushing Mongolian-American Artist - Cori Anderson, 303 Magazine. 2/23/17 - 11 Photographers to check out during Denver's Month of Photography - Cori Anderson, 303 Magazine. The Lowdown: Tya Alisa Anthony is a Denver-based artist who presents social, environmental, cultural and political narratives with her work. SKINs— a photographic exhibition shown at Leon Gallery—will examine the idealization of body image, both physically and metaphorically. About her work, Anthony explains, “I create visual personifications of identity narratives through photography, drawing and mixed media. I explore the gaps of knowledge of my own heritage with vivid imagery addressing a once declared chameleon identity… I am most interested in metaphoric masks worn as protection and representation of Identity.” These particular pieces were inspired by organic colors and textures and natural weathering processes that relate to aging. 1/5/17 - The top 10 art exhibitions of 2016 in Denver - Michael Paglia, Art, ltd.
A stunning combo of abstracted busts paired with wallpaper-like paintings. "In Revelations, the eye suggests God’s knowledge, awareness, and concern. In The Deep End, the symbol also encourages looking as an active choice. Looking is hunting and searching for meaning or for answers. Saiz makes our terrors tangible in his artwork. By acknowledging fears in the periphery of our daily lives or the dark corners of our minds, the mechanisms of control — whether god or government — are disrupted. The gaze is powerful." "The exhibit, “The Deep End,” distributes his brilliant and confused mind across the walls of Leon and it is as entertaining and immersive as any Hollywood blockbuster, though without the big-budget. There’s an unpolished, D.I.Y. aura to the effort that makes it personal, sincere and, almost, convincing." "Though many of Saiz’s works are compelling, the showstopper is the monumental “It’s only working ’til it isn’t,” made up of thousands of little plastic boxes, each containing a minuscule painting. Trussed up with brightly colored cords and painted over in places, the piece takes on a jagged horizontal form that stands out from the wall." "Conspiracy theories are sometimes alluded to in art, but are not usually addressed directly. Often, these ideas are side-stepped perhaps due to the artist’s fear of losing credibility. But Denver-raised artist Jonathan Saiz wants to confront the stigma of believing in conspiracy theories by representing them in visually stunning displays of intense complexity." 07/01/2016 - "Observing (A)Trophy Life - Celebrating Our Luxury of Social, Personal and Political Addiction" by David Freeman, critiqued by Odessa Denver. "Denver artist Matthew Harris is on a quest to uncover some of those flaws with meticulously sculpted and grotesque statue heads which seduce the eye from a distance and repulse it from up close. In doing so, he hopes that viewers of his work may rethink how they deal with the reality of imperfection" written by Cori Anderson. 05/19/2016 - Matthew Harris receives wonderful and extensive coverage of his upcoming exhibition at Leon "Baroque Selfies", opening July 31st. Pick up your May/June copy in stores today to read the wonderful review. Visit Art Ltd. for more reviews. 05/01/2016 - Tim Schwartz' "Escapism" at Leon is featured in this months issue of Art Ltd. Review written by Michael Paglia of Westword. 04/07/2016 - Michael Paglia of Westword covers "Escapism", a solo exhibition by L.A based artist Tim Schwartz. 03/30/2016 - The Denver Small Press Fest has won Best New Festival in Denver. Leon Gallery collaborated with a number of influential Denver creatives, including Dan Landes of Suspect Press and City O' City, Kaela Martin and Greg Ferrari at Walled In Magazine, and Derrick Mund of Spring Gun Press. 03/30/2016 - Matt Scobey's show, "The Essence", has won the prestigious award of "Best Use of Concrete" from Westword Magazine's "Best of Denver" awards. 03/30/2016 - Davey B. Gravey's Tiny Cinema has won "Best New Super 8mm film", which premiered at Leon in February, from Westword Magazine's "Best of Denver" awards. 03/05/2016 - Wonderful mention in 5280 for Tim Schwartz' solo exhibition, "Escapism". Opening Reception on March 12th, from 7-11pm. Gravey's Tiny Cinema will be parked in back of Leon Gallery, and the short film will be shown to a handful of viewers at a time while the gallery slings drinks and gets people moving with a guest DJ inside. 02/25/2016 - Westword interviews David B. Gravey on his debut screening of "Moonglow" with Tiny Cinema at Leon Gallery. 02/23/2016- Wonderful write up in Denver's own 303 Magazine, featuring some of Amanda Tipton's beautiful photographs of Jess Webb's current exhibition "In-Between Life & Death" on view through March 5th. 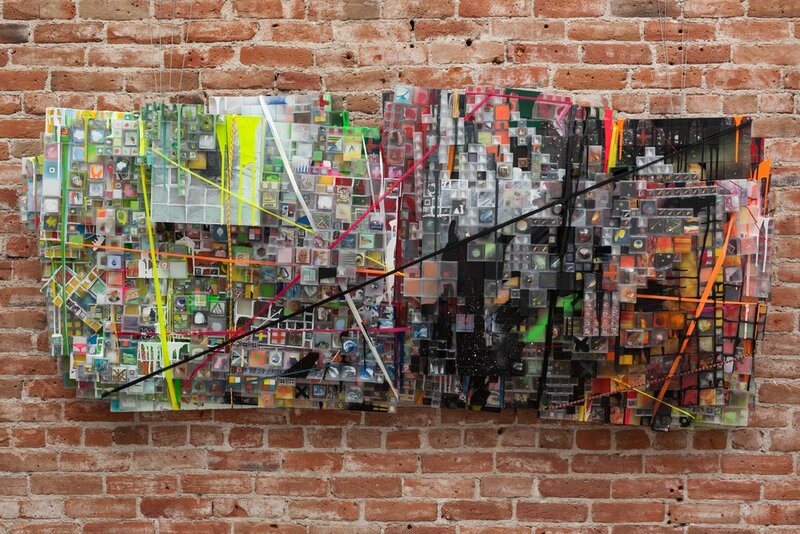 "Iconic big strange works on wood that feel retro-primal" - Walt Morton on Michael Dowling's work at the LA Art Show. 01/31/2016 - Michael Dowling exhibiting with Leon Gallery at the LA Art Show receives praise in "Walt Morton's Picks: The Best Paintings at the LA Art Show, 2016"
01/03/2016 - Ray Rinaldi of The Denver Post reviews "The Art of War", a remarkable solo exhibition by Jolt. "Jolt — Guerilla Garden founder, Westword MasterMind and art curator for Artopia 2016 — is always fighting to legitimize graffiti art by creating bold, writing-based graphic murals and heading up a hub for like-minded street artists. Now he's bringing his style indoors for a solo show at Leon..." written by Susan Froyd. 12/11/2015 - Westword has mentioned our upcoming exhibition,"The Art of War" by Jolt, in their latest article exploring five new art shows in Denver this month. Written by Susan Froyd. 11/27/2015 - Ray Rinaldi of The Denver Post reviews "Left Ajar: Plastic Old and Our Bright and Shiny Future Together" by Diego-Rodriguez Warner and Matthew J Mahoney. We are very excited to announce that Leon Gallery is teaming up with Clyfford Still Museum to bring a little color and art into the Black Friday madness. With your visit,to Leon, receive a free ticket to the Clyfford Still Museum! This year, brighten up your Black Friday by visiting Leon Gallery and opting for art instead! 11/27/2015 - Westword covers "7 Ways to Avoid Black Friday in Denver" with Leon's "Put a Little Color in Your Black Friday" event. "At this highly anticipated dual exhibition, catch two artists who delve into the Technicolor cacophony of our world." - 5280 Best Bet Award for the Arts for the month of November. 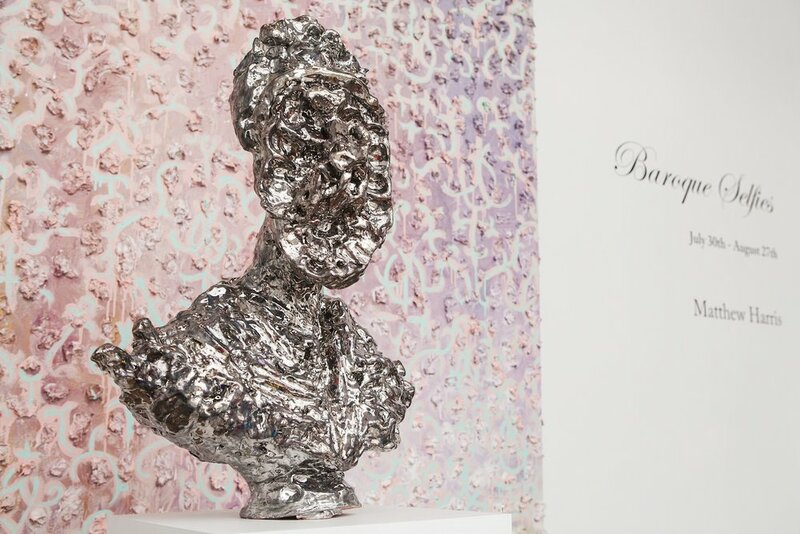 11/04/2015- "Left Ajar: Plastic Old and Our Bright and Shiny Future Together", a two-man exhibition by Diego Rodriguez-Warner and Matthew J. Mahoney, receives 5280's Best Bet Award for the month of November. 11/03/2015- Award winning PBS-KBDI Producer / Reporter, Eden Lane, stopped by the gallery to film and interview Diego Rodriguez-Warner on his upcoming show at Leon, "Left Ajar: Plastic Old and Our Bright and Shiny Future Together"; a two-man exhibition with Matthew J. Mahoney. "Matt Scobey has been part of the Denver scene for ten years, but he has never had a higher profile than he does right now..." - written by Michael Paglia. Photograph by Amanda Tipton. 09/23/2015 - Michael Paglia of Westword stops into Leon to explore and discuss Matt Scobey's "The Essence"; "Art Review: Matt Scobey Presents Concrete Ideas At Leon Gallery". “The idea for Press Fest came to me and my partner in Walled In magazines, Gregory Ferrari, via Eric Dallimore,” Kaela Martin, one of the Fest’s founders, told 303 in an exclusive interview. “He is the co-owner of Leon Gallery and was so inspired by the NY Art Book Fair that he wanted to gather a crew to make something similar in Denver: something that wasn’t just a book fair, but instead, a showcase of art and all kinds of works in print. Eric reached out to others: Daniel Landes of City O’ City, Derrick Mund of SpringGun Press and of course his partner at Leon, Eric Nord..." Written by Addison Herron-Wheeler. 09/16/2015 - A lovely write up by 303 Magazine giving you the Top 5 Reasons Why You Should Go To Denver Small Press Fest. The events' first year, co-curated by Leon's Eric Dallimore and Eric Nord, along with City O' City and SpringGun Press. Congratulations to Matt Scobey for a fine write up by Ray Rinaldi in the Denver Post for his exhibition "The Essence". "Matt Scobey is one of the most interesting artists working in Denver today, and mostly because he's so hard to pin down. The concrete objects he's currently displaying at Leon Gallery position him somewhere between creative madman and sharp-minded entrepreneur." "Matt Scobey's rough, romantic concrete at Denver's Leon"- written by Ray Rinaldi. Photograph by Amanda Tipton. 09/04/2015 - Ray Rinaldi of The Denver Post reviews Matt Scobey's ‘The Essence’ exhibition, on view at Leon from August 28th through September 26th. "KUVO's visual arts consultant Hilary DePolo booked the guest on her monthly feature "Art Scene" far in advance of this week's nuclear weapons treaty announcement with Iran. Her guest, Eric Dallimore of Leon Gallery (1112 E 17th Ave., Uptown) is opening an exhibit of Iranian-American artists called Continental Divide: East of L.A./West of Tehran." Image courtesy by Amanda Tipton. 07/17/2015- KUVO's visual arts consultant Hilary DePolo speaks with Eric Dallimore on "Continental Divide: East of L.A / West of Tehra". Our anticipated summer group show that is in conjunction with this year's Biennial of the Americas, "Continental Divide: East of L.A / West of Tehran" has been chosen as the top five exhibitions to see! "Leon Gallery took a different tack in exploring the Biennial theme by focusing on the Persian-American immigrant experience. A conversation with Safa Samiezadé-Yazd — a local artist who’s worked on a national level for Aslan Media and Boomgen Studios — first opened Eric Dallimore’s eyes to the unique position of her culture-straddling compatriots in America: Iranian-American artists struggle not only with their mixed cultural identity, but also with the question of whether that’s a theme they should pursue in their work." "Five Biennial-Inspired Exhibitions at Denver Galleries and in the Streets!" - written by Susan Froyd. Photograph: Amitis Motevalli, "Portrait of the Artist as a Young Rebel," 2005. 07/15/2015 - Susan Froyd of Westword nominates Leon's "Continental Divide: East of L.A / West of Tehran" group exhibition as part of the five biennial-inspired exhibitions to not miss out on. "Starting this week, Mehran has work appearing in two Denver exhibitions: the Museum of Contemporary Art's Biennial exhibit, "Now? NOW!" and Leon gallery's "Continental Divide: East of L.A. / West of Tehran." Both run through the end of August." "Through Art, Laleh Mehran Explores The Idea Of Iranian-American" - written by Stephanie Wolf and interviewed by CPR's Ryan Warner. 07/16/2015 - Laleh Mehran speaks with Colorado Public Radio about her piece "Dominant Policy" in Leon's summer group exhibition "Continental Divide : East of L.A / West of Tehran". READERS' CHOICE: BEST GALLERY SHOW-- SOLO (2015) Lauri Lynnxe Murphy's exhibition, "Lament", at Leon Gallery. Photograph by Amanda Tipton. 11/2015 - Westword's Readers' Choice awards Lauri Lynnxe Murphy's "Lament" exhibition at Leon the 2015 Best Gallery Show. "As much as these are kind of dismissible images in many respects, I see a lot of magic in them and a lot of serendipity,” Isaacs says. “They're exquisite moments." The exhibition “36 Views of the Lion’s Lair” runs at Denver’s Leon Gallery through Jan. 4. The title references “36 Views of Mount Fuji,” a renowned series of woodblock prints created in the 19th century by Japanese artist Katsushika Hokusai. Written and photographed by Corey H. Jones of CPR. 12/08/2014- Colorado Public Radio arts editor Chloe Veltman speaks with photographer Gary Isaacs regarding his show "36 Views of the Lions Lair", a photography exhibition at Leon. We are excited to announce our exhibition "Sweet, Sweet Life: The Photographic Works of John Denver" is announced a Denver's Best Bet. “Denver was also a photographer, toting his camera along on concert tours, backpacking trips and jaunts around the globe, and his visual work, on display at Leon Gallery, shares that same tone. It has what you'd expect from the author of chart toppers like "Take Me Home, Country Roads" and "Sunshine On My Shoulders" — scenes of nature, up close and personal, and people, near and far.” "Best Bet: John Denver, photographer" -written and by Ray Rinaldi of The Denver Post. 01/17/2014 - The Denver Post names Leon's "Sweet, Sweet Life: The Photographic Works of John Denver" exhibition a Best Bet.